Does Oatmeal Turn Into Starch? Does Oatmeal Strengthen the Muscles? No food can strengthen your muscles if you don't also exercise. However, foods high in certain nutrients can help rebuild your muscles to be stronger after exercise. Oatmeal contains the protein and carbohydrates necessary for building muscle to increase your strength, as well as micronutrients that help support muscle function. Cooking oatmeal with milk instead of water and topping it with fruit increases its macronutrient content to promote more muscle building and strength. Your muscles are made of protein, so plenty of it is required to build new muscle. 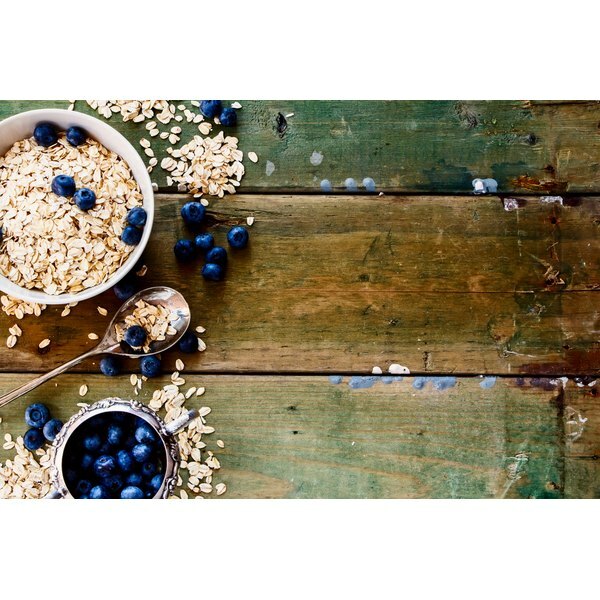 A half cup of uncooked oats contains 5 grams of protein. According to the Academy of Nutrition and Dietetics, you need 1.4 to 1.8 grams of protein per kilogram of your body weight each day, in addition to regular strength training, to increase muscle mass. While protein builds muscle, carbohydrates fuel them with energy for repairing, building and strengthening. If you're strength training, at least half your total calories consumed in a day should come from carbohydrates. A half cup of uncooked oats contains 27 grams of carbohydrates. Fat is also an essential part of your diet, as it also supplies fuel for your muscles because it's high in calories. A half cup of oats gives you 3 grams of fat.